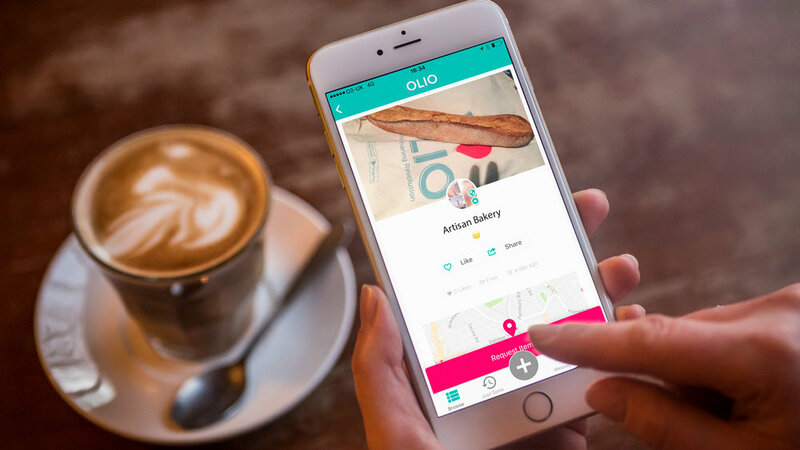 OLIO is a smart app tackling the impact the issue of food waste, one listing at a time. If food waste were a country, it would be the third largest emitter of greenhouse gases after China and the USA In the developed world 50% of food waste is produced in the home . OLIO connects neighbours with each other and with local businesses so surplus food can be shared. To make an item available, simply open the app, add a photo, description, and when and where the item is available for pick-up. To access items, simply browse the listings available near you, request whatever takes your fancy and arrange a pick-up via private messaging. OLIO believes that reducing food waste will make for a more sustainable future where our most precious resources are shared, not thrown away. We interviewed Tessa Cook, co-founder of OLIO about the story of the app and where she sees the future for OLIO. How was your idea born and what inspired you to address food waste in the home? I’m a farmer’s daughter, and so have always hated throwing away good food. This is because I know from first-hand experience just how much hardwork goes into producing it! As a result, the inspiration for OLIO came when I was moving country and found myself on moving day with some good food that we hadn’t managed to eat, but that I couldn’t bring myself to throw away. And so I set off on a bit of a wild goose chase to try and find someone to give it to, and I failed miserably. Through the whole process it seemed to me crazy that I should have to throw this food away when there were surely plenty of people within hundreds of metres of me who would love it, the problem was they just didn’t know about it. And so the idea of OLIO, a mobile app where neighbours and local shops & cafes can share surplus food, came about. Once my Co-Founder (Saasha Celestial-One) and I started researching the problem of food waste, we became even more committed to solving the problem because what we discovered was truly shocking. Specifically, globally one third of all the food we produce gets thrown away, whilst 800m people go hungry (who could be fed on a quarter of the food we waste in the West), and if food waste were to be a country, it would be the third largest source of greenhouse gases, after the USA and China! We are particularly interested in ways technology like your app address important environmental challenges. How does technology support your organization? Technology is absolutely central to OLIO, and indeed, OLIO wouldn’t have existed 5-10 years ago because the technology we’re leveraging was sufficiently widespread. In a nutshell, OLIO meshes together geo-location data, direct messaging and the phone’s camera capabilities to enable a hyper-local marketplace for surplus food. However, equally as important to the enabling technology is the consumer mindset shift that is required – to one that sees food as precious, and sharing as an everyday part of modern sustainable city living. Where do you see technology addressing food waste moving forward? There are a number of startups that are using technology to address the problem of food waste, and all will play a critical role in solving this enormous problem. Some of our favourites are Mimica – which is a type of packaging that can detect when the food inside it has gone off; and Winnow, which helps commercial kitchens reduce their food waste. What would you say was your biggest challenge so far and where would you like to see OLIO in five years? With regards to challenges, one of the biggest is how to grow the user base with a marketing budget of close to zero – that’s where our Ambassador programme of volunteers spreading the word about OLIO in their local community, comes into play. At the moment we have over 18,000 Ambassdors and have reached almost half a million users, so it seems to be working well! Looking forward to the next 5 or so years, our ambition for OLIO is an unashamedly bold one – it’s of growing from half a million users, to hundreds of millions of users who are all sharing instead of binning our most precious resource! OLIO relies on an active community using the app. How do you find new users and keep the current users motivated? We find new users through word of mouth, our Brand Ambassadors, media coverage and some advertising on Facebook. In terms of keeping current users motivated, the most powerful thing here is their experience of sharing – most of our users tell us that sharing food with someone who wants, or even needs it, is an incredible feeling! Do you have any advice to someone with an idea that addresses an environmental challenge and that they want to bring it to life? My advice would be threefold: 1) Make sure that you are truly passionate about the problem you are solving, and ensure that this translates into a very strong mission for the company; 2) Read ‘The Lean Startup’ and ‘The Mom Test’ if you haven’t already, and really absorb the incredibly important messages that both contain; 3) See if you can test your idea in a low cost way, ideally by leveraging existing platforms, to get feedback before investing your life savings and/or raising capital. And finally, have fun because life is short! Olio relies on a local community of active users that stay engaged. The app shows 2545 OLIOers in proximity of 2 kilometers of our London location, however only five active users listing 17 items between Food and Non Food. We have noticed an increase in around 200 users since we downloaded the app a couple of months ago. The number of listings has remained about the same. To test the app we requested an item with a local OLIOer at Champion level in the area. We had noticed the user adding new listings almost daily and she is currently the most active user in the area. The reply was quick and the OLIOer advised us, that the items were located in a plastic box just inside the front gate of the house at her address. A quiet residential street was the location of our OLIOers house. The box was clearly visible just inside the gate. Initially we were a bit hesitant to take the chosen items out of the box because of a neighbour arriving home, she did not look surprised. Clearly it was not the first time she had seen OLIOers taking items form the box. We chose two cans of soup, closed the box and thanked the Champion User with a 5star review. Taking items from a box inside the gate might not be quite the same experience as the human connection of sharing your food in person, but it does offer an solution for flexible pickup in a busy city. OLIO has been consistently improving the app by adding new features like the feed. GrowSmartFuture recommends adding the option of a second location that can be continuously updated, so that OLIOers can see and list items near their work, university, holiday location and more while still keeping an eye on listings near their primary location, most likely the home. To encourage more listing we could recommend a rewards program for active users. (Sponsored) experiences ranging from cinema tickets, to theatre, amusement parks, family activities could be a fun and waste free solution.